2 days after I flew into Singapore, I hopped into McDonald's to try the Criss Cut Fries, as I knew they had been for sale for the previous month, and I didn't know when they were going to be finished. 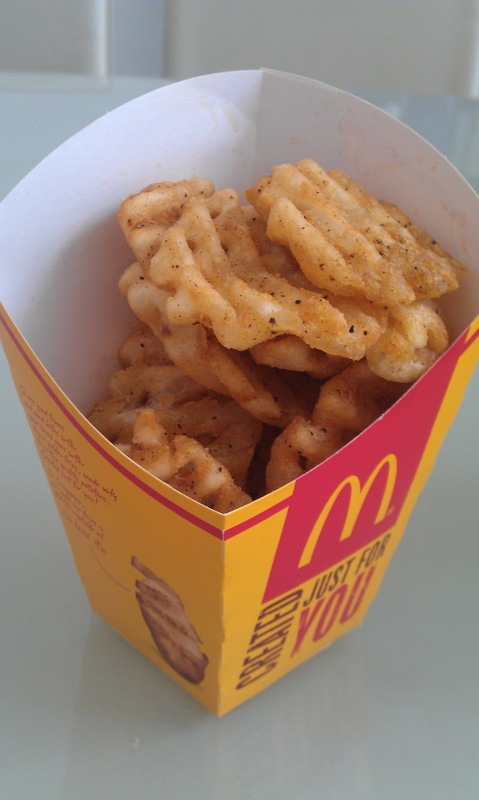 What I was shocked to see when I entered was the pricing, they were $3.50SGD for just the fries! McDonald's Singapore does not post pricing on their website, and in comparison to a meal at a hawker centre here that might set you back $3, it can be quite an expensive alternative to a local meal when a combo costs +$7. So as much as I didn't want to order a combo two days after arriving in Singapore I felt it was a better value to add them to a combo for only 50 cents instead of paying $3.50 for just fries. I was jetlagged, so I didn't feel like sitting inside the restaurant to eat so I carried my meal the 5 minute walk back to my new flat and ate it there. 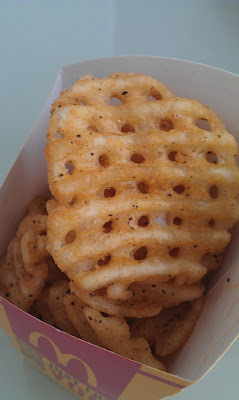 I was disappointed when I took the fries out of the takeaway bag because even though you had to pay a premium for the crinkle cut, the packaging was pretty small, and you didn't get that many pieces. The fries themselves were actually pretty good as they had a seasoning on them that I haven't had before at McDonald's (so I guess that is where the premium goes). If you can imagine the seasoning on thick cut fries at a restaurant, these would be a similar seasoning. McDonald's in Singapore has self-serve Chilli dispensers (just the same way Ketchup is served in the US) and these were nice to dip in the chilli sauce. Though I enjoyed the taste, and though the 50cent premium was acceptable with a combo. If I had paid $3.50 for these as a standalone, I would have been extremely disappointed with the size.